Scottsdale Public Art (SPA) is entering its 25th year and has built a reputation as one of the top quality programs of its kind in the entire country. This is due to the vision of past civic leaders who created a funding mechanism through city ordinance in 1985. The AIPP ordinance mandated a 1 % contribution for public art applied to all new Capital Improvement Projects (CIP). A companion ordinance for a 1% contribution to Public Art in Private Development (AIPD) insured a balance of public and private funding and ability to create engaging art experiences throughout Scottsdale. Today, we are proud of having 86 projects in private development and 70 world class public installations with another 17 AIPP plus 5 AIPD in various stages of development. Additionally, we have been able to fund numerous ‘time based’ or temporary installations to augment civic art events and create an artistic-surprise like the Red Ball project. Few cities of any size can equal what has been accomplished in Scottsdale. From our magnificent freeway art walls to citizen driven projects like the new War Memorial to the Love Sculpture by Robert Indiana and ranging from the entrance signs that grace our parks to the citizen involved crochet ‘Coral Reef’ project in the downtown main library, Scottsdale Public Art has enhanced our city’s cache. It has enhanced Scottsdale’s cultural reputation and has received tremendous local and national recognition. Despite our accomplishments, new challenges have arisen due to the difficult economy and maturing nature of our Public Art Program. Efforts have been underway for several years to amend the SPA funding to insure stability & continuity for the program. After two years, the AIPP ordinance revisions were completed and approved by the city council in conjunction with the new city contract for the Scottsdale Cultural Council. The AIPD ordinance is not yet complete but when approved will be expanded city wide to create a broader income stream and offset loss of AIPP revenues. Meanwhile, the program has had to make substantial cuts to marketing, conservation & programming. Our long term trust fund will be depleted in just two more years unless new sources are found. Rest assured that the SPA Staff and Board are working to provide long term stability and growth of our program. Scottsdale Public Art’s newest installation are the 14 foot tall horses along Indian Bend Road between Scottsdale and Hayden. If you’ve not seen them, threat yourself with a drive to see these four magnificent steeds. You will want to park and walk down to get a closer view. It is worth every minute and is symbolic of the power of our investment in public art for ourselves and as our legacy to the generations yet to come! 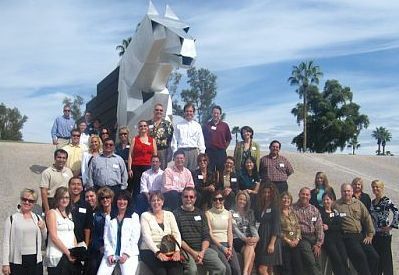 Please visit us at www.scottsdalepublicart.org to see many of the exciting completed projects and mark your calendar for events surrounding our 25th Anniversary year starting this fall with the completion of the Soleri Bridge project across the canal at the Scottsdale Waterfront. This ambitious project will add to the excitement of the Herb Mignery Bronze ‘Passing the Legacy’ and Donald Lipski’s ‘The Doors’ already on site.